Three more experiments with paintsticks and thin silk. Red oak leaves, stabilized onto freezer paper, with fabric ironed on over the top. 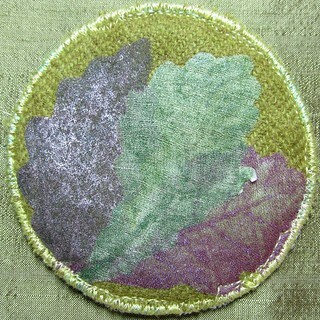 I was trying to make clearer images by holding the leaf and the fabric still. The left one is on black organza, the center one is on green dyed silk gauze, the right one is also on silk gauze but a contrasting color paintstick. The three are fused onto a much calmer background, but the effect is still nothing like I was hoping for. Interesting, and hazy, but not what I meant to do.